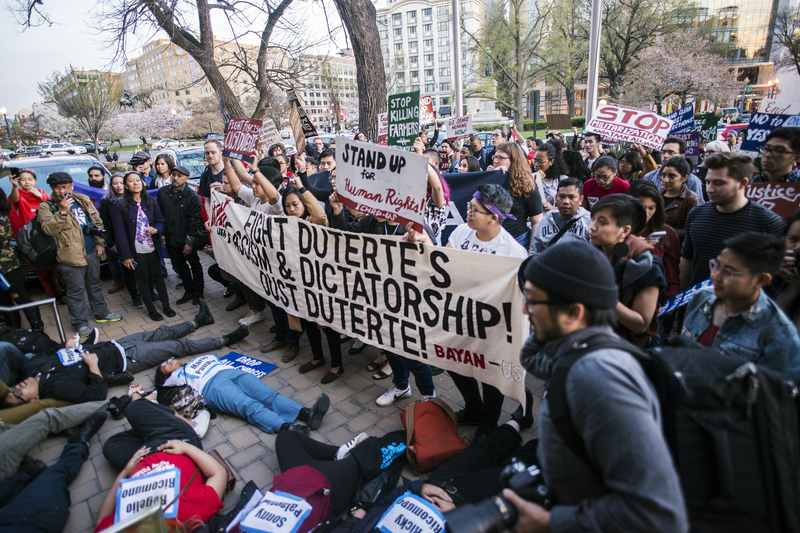 “This is disaster opportunism at its finest,” expressed BAYAN-USA Chair Bernadette Ellorin in response to the pro-militarization push made by Philippine Foreign Affairs Secretary Albert Del Rosario and U.S. Congressmen Chris Smith (R-NJ) and Trent Franks (R-AZ) this week, following the U.S. lawmakers’ tour of communities devastated by Typhoon Haiyan. BAYAN-USA found statements made by the government representatives during their joint press conference particularly appalling. Del Rosario stated, “I think this demonstrates the need for this framework agreement we’re working out with the US, because it accentuates the purposes of the framework [one of] which is to make humanitarian assistance and disaster relief and response is a very major aspect of the agreement.” Rep. Smith added, “We know that negotiations are under way. I think, in a paradoxical way, the storm has brought all of us even closer. Every other, economic, [trade] and other ongoing negotiations will be given a positive boost as a direct result of all of these.” Del Rosario and Smith were referring to the Framework Agreement for Increased Rotational Presence and Enhanced Defense Cooperation which the US and Philippines have been negotiating for several months and which would result in the deployment of thousands of additional U.S military personnel to the Philippines and the whole Asia Pacific region. The government pronouncements came right before Thanksgiving, an American holiday that many condemn for whitewashing the history of genocide and conquest of Native peoples in the United States.